It's a great trailer. As noted in our reaction log, it features New Donk City, a weird city of HUMAN SCUM that has a lot of places named after the Donkey Kong Country series. According to Shigeru Miyamoto, the likely reason for that are the younger developers and programmers on the team. Reminder that Super Mario Odyssey is made by the overall group of people who made Donkey Kong Jungle Beat, which had no Donkey Kong Country references at all. They must've gotten some new blood in the ten years afterward that wanted to make up for that. Anyway, Super Mario Odyssey is pretty high-energy. 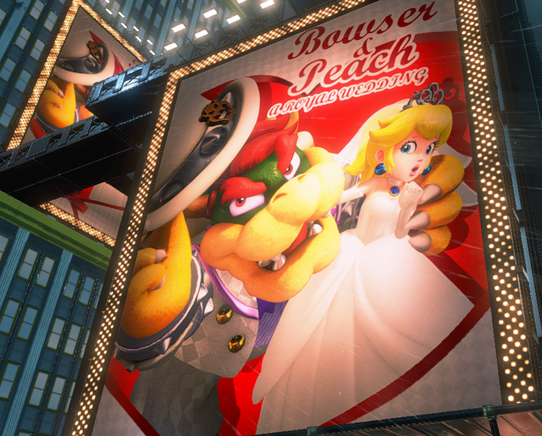 It also features King Bowser Koopa having another wedding attempt with Princess Peach. He looks even better than his first two tries! This time, King Dad is actually planning this wedding ahead, with an awesome outfit and POSTERS! There's a lot of other aspects of the trailer of interest, but Rawk brought one to my attention: Those four rabbits on the airship near the end. According to him, the one in the blue suit (the left-most one) is me turned into a rabbit? 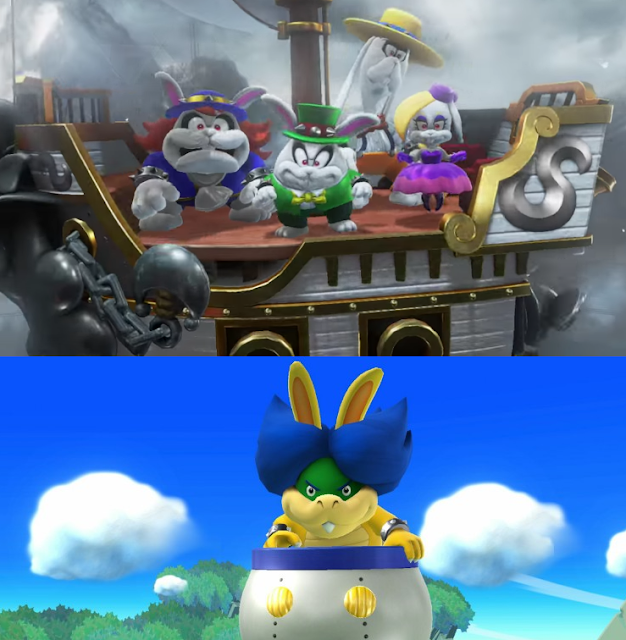 Top: Four rabbits on an airship in suits, likely attendees of the wedding. The one to the left, according to a KoopaTV staffer that isn't me, is me. I think you can look at the above picture and come to your own conclusion. I have no association with those rabbits. While I'm dropping truth-bombs, one thing that's apparent in Super Mario Odyssey is that Mario's hat is sentient. “Let me tell you more about Mario's Cap. It is tied to his very essence. His life force. That analysis now looks like common-sense because, hey, now the hat has its own set of eyes. Back in MY day, Mario's Cap was trying to hide its sentience! Mario's Cap giving up the act is likely due to KoopaTV's muckraking. If not for our investigative reporting, Mario's Cap wouldn't openly be flaunting its parasite status right now. In a highly-populated urban area, no less. Compare to the fake news reporting of illegitimate people and organisations, such as the so-called “Laura Kate Dale”, a widely-spread liar/journalist who was banned from Nintendo's press stuff due to being a dishonest scumbag. He made a bunch of stuff up from “sources” (this should trigger your skeptical side) about the Nintendo Switch and what software and features it'll have. He was wrong. That's what happens when you report fake news for attention. You sort of get your whole life into this weird parallel, fake world. That's why this dude is referring to himself by “Laura”, and dyed his hair blue. Believe me, I know what real blue hair is like, and this dude ain't got it. 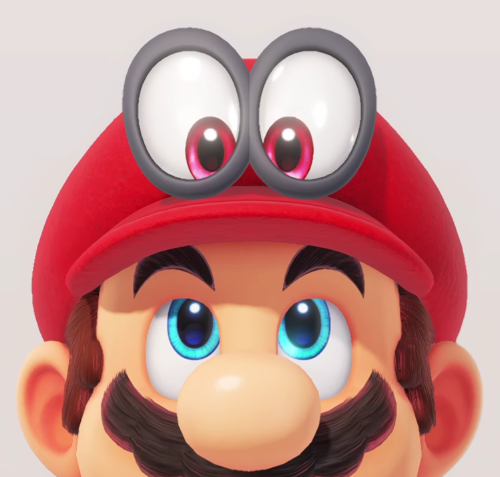 Is Mario really who he says he is when his hat keeps showing up on everyone else's heads? You can find out this holiday 2017, if you have a Nintendo Switch by then. Ludwig doesn't actually know when he'll get a Nintendo Switch! Oh no! Anyway, stay tuned to KoopaTV for genuine analysis that you can count on, and stay far away from fakers who cannot even stay true to themselves. Mario's Cap is named Cappy, and it is the ultimate evil in the world. KoopaTV's investigative reporting continues, post-E3! Ludwig tries to make up for his treatment of Laura Kate Dale in this article with THIS one. With 10 months of coverage after this article, Super Mario Odyssey has been released! The sentient hat gives off an eerie resemblance to the McDonald's Happy Meal box. Im hype for this game!!!!! I actually like Mario as well, bummer. This is a totally bizarre spam "conversation" and I'm not sure what to do with it. A simple demonstration on how we're sick of fake news, and we need to call it as it is. The original draft of the article was actually even more harsh, but the QA department didn't like it. We do like to have good humour, but we also sometimes contrast that with raw truth. It makes for good effect. Thanks for enjoying the article otherwise!